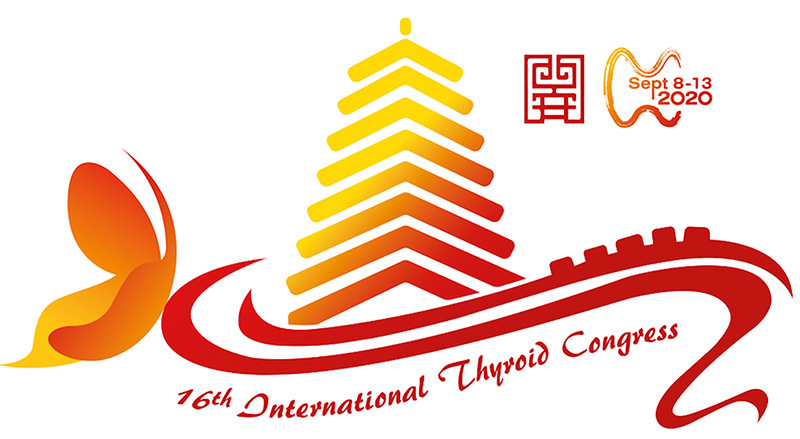 The 16th International Thyroid Congress will be held in Xi’an, China, on September 8-13, 2020 with the Chinese Society of Endocrinology composing the Local Organizing Committee. This was officially announced at the Closing Session of the 15th ITC held at the Walt Disney World Swan & Dolphin Resort in Orlando, Florida, USA. An audio-visual presentation for the 16th ITC was shown followed by the invitation speech by Weiping Teng, AOTA Vice President and Chair of the LOC. This will be the third time that AOTA will host the ITC following a system of rotation among the 4 Sister Societies in Thyroidology. Sydney (Australia) hosted the 8th ITC in 1980 and Kyoto (Japan) the 12th ITC in 2000. Xi’an is the capital of Shanxi Province, China, and the cultural and educational center of west China. It is a popular center for international conferences and exhibitions. Once the political, economic and cultural center of China, Xi’an has been the first Chinese city open up to the outside world and the starting point of the well-known Silk Road. The video presentation featured places of interest of the old and the new faces of the ITC host city. The address of formal homepage of AOTA was changed to “http://aota.kr”. 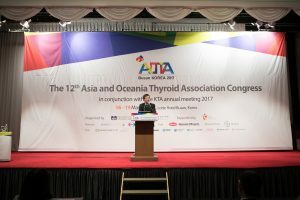 The 12th Asia & Oceania Thyroid Association (AOTA) Congress held in Lotte Hotel Busan, Korea, during March 16-19, 2017 has been recently concluded with great success. The congress was held in conjunction with Korea Thyroid Association (KTA) annual meeting and was co-chaired by Prof. Won Bae Kim and Prof. In Joo Kim. Since Korea had held the 4th AOTA congress chaired by Prof. Munho Lee, in Seoul, in 1989, it was the second time for Korea to host the AOTA congress. The number of registered participants and accompanying persons in Busan AOTA 2017 was 592 from 25 countries represented (as of Mar 19). 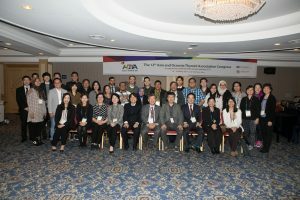 Participants were not only from AOTA member countries (Korea(324), Japan(61), Indonesia(61), Philippines(32), Taiwan(25), China(20), India(15), Australia(10), Singapore(8), Bangladesh(2), Iran(1)), but also from non-member countries (Malaysia(7), Thailand(5), Myanmar(3), Unites States(3), Canada(2), Germany(2), Morocco(2), Turkey(1), Oman(1), Saudi Arabia(1), Hong Kong(1), Russia(1), Netherland(1), Italy(1), and Kazahkstan(1)). The congress started on March 16th with preconference activities including Thyroid Ultrasound Course and Joint Symposium by Working Group of Asian Thyroid FNA Cytology. In opening session, Prof. Duncan Topliss from Australia delivered an opening lecture with the title of ‘Recent Advances in Thyroid Diseases’ and a Memorial Lecture for passed Professor Emeritus Dr. Shigenobu Nagataki was dedicated by Prof. Shunich Yamashita from Nagasaki, Japan. Scientific program were consisted of plenary lecture, 2 special lectures, 11 symposium sessions, 10 meet-the-professor sessions, 12 oral sessions and so on, which is the most voluminous program ever in the AOTA congresses. Totally 319 abstracts were submitted for scientific sessions, and 8 papers were awarded as distinguished abstracts (Prakash Gangadaran from Bangladesh, Hidefumi Inaba, Shinichi Suzuki and Yasuyo Nakajima from Japan, Soo Yeon Hahn and Eun Ju Ha from Korea, Sukriti Kumar from India and Xiaoxiao Cao from China). AOTA prize of year 2017 awardee was Prof. Weiping Teng from China, but AOTA prize lecture was cancelled due to absence of awardee. LOC supported 29 registrants with travel grants (500 USD for each) based on country of presenter (low –middle income countries by World Bank) and quality of abstract. The congress was a great success not only in the number of participants but in quality of scientific sessions. The congress was closed, pledging to meet again in the next AOTA congress which will be held in Sydney, Australia in 2019. 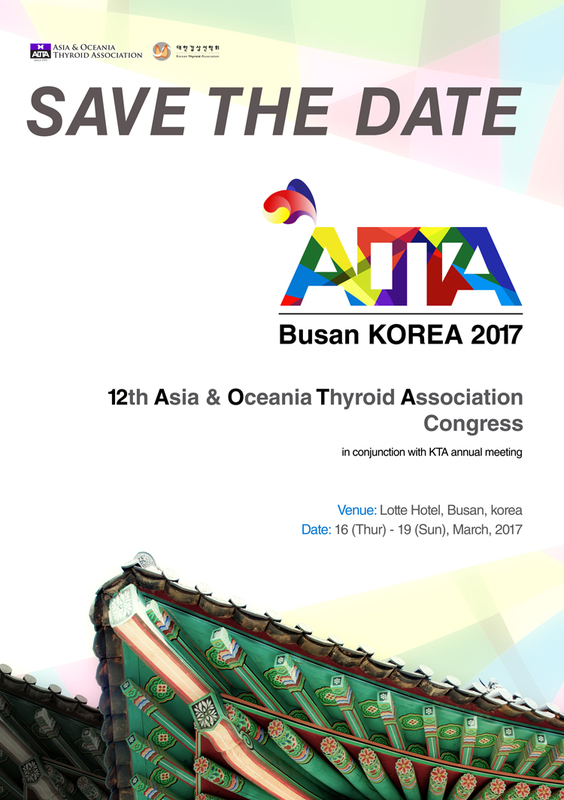 The city of Pusan in Southeastern Korea will be the site of the 12th AOTA Congress to be held on March 16-19, 2017. This will be the second time that the Congress will be held in Korea after the country hosted the 4th Congress in April 1989. The venue will be Lotte Hotel Busan, Korea (http://www.lottehotel.com/busan/ko/). The Local Organizing Committee that will handle the scientific and social programs will be reconstituted in September 2015. 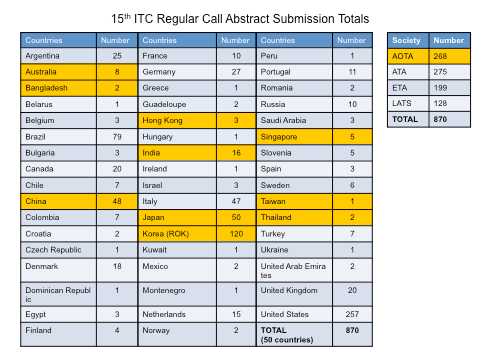 The Program Organizing Committee (POC) of the 15th International Thyroid Congress had received 870 Regular Call Abstracts from the 4 Sister Societies in Thyroidology. AOTA contributed 268 abstracts from 10 Asian countries. 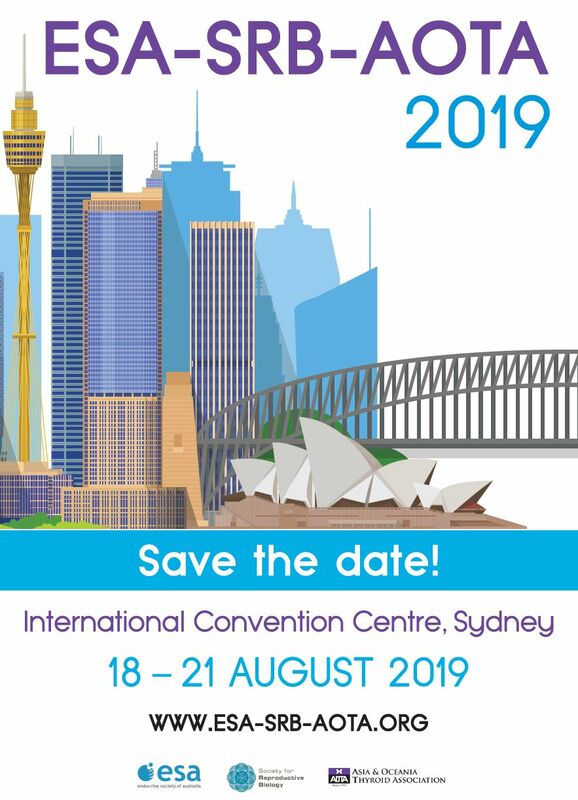 Out of these abstracts, AOTA POC chose the Top 20 Abstracts from Asia & Oceania from which 11 authors were recognized to receive the Young Investigators’ Award with the corresponding prize of US$ 1,000 each. They received their prizes during the AOTA General Assembly on October 19, 2015. 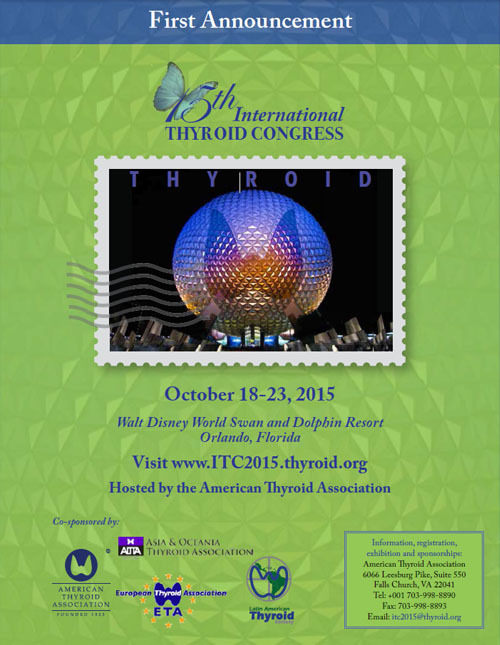 The recently concluded 15th International Thyroid Congress held in the Walt Disney Resort Swan & Dolphin Resort in Orlando, FL, USA, from October 18-23, 2015 had set some records of its own compared with previous ITCs. The number of registered participants and accompanying persons in the Orlando ITC was 2,436 from 88 countries represented (as of October 19). While this number was lower than the Paris ITC in 2010 which drew 3,326 participants and guests, there were more trainees (445 vs 371) in 2015. There were 52.3% males compared with 47.7% female registrants. The number of women was noted to be increasing compared with previous congresses. More than the majority of the attendees were MD (59.1%) with MD-PhD (17.3%), PhD (9.8%), and DO, RN, PA, NP comprising 2%. Endocrinologists account for 55.9% of participants, followed by Endocrine Surgeons (10.9%), Oncologists (4.5%), ENT (4.5%), Nuclear Medicine (3.1%). Participants described their work to be in the academe (39.6%), hospital based (32.9%), and private practice (13.7%). The ITC is composed of 4 Sister Societies meeting together. Attending the 15th ITC were 516 ATA members, 122 ETA, 96 LATS and 87 AOTA. However, Non-Members comprise a sizable number with ATA 245, AOTA 238, LATS 186 and ETA 144. 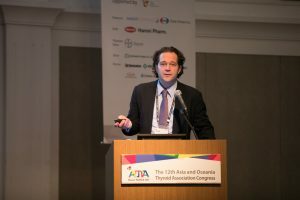 This year’s ITC also featured the first Chester “Chip” Ridgway Training Course geared for young thyroidologists, coming from the ATA. There was also a session on the History of the 4 Sister Societies with AOTA’s significant landmarks provided by AOTA Honorary President Shigenobu Nagataki of Japan. A Panel Board photographs of goiter and other iodine deficiency disorders and of the men and women who contributed to the science of thyroidology since BCE era was displayed. These provided ITC participants with information on important milestones in the course of many centuries since the thyroid gland was discovered to play role in human health. 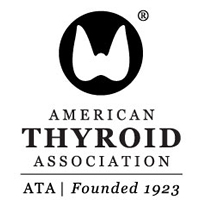 (Download ATA website www.american thyroid association & click on Clark T. Sawin History Resource Center). Prof Akira Miyauchi of Japan delivered the 2015 NAGATAKI-FUJIFILM Prize Lecture during the 15th International Thyroid Congress held in the Walt Disney World Swan & Dolphin Resort in Orlando, Florida, USA. AOTA has been giving Prize Lecture Awards since 1980. Through the years, the Prize Lectures came under various names as defined by the sponsors. It was in 2010 during the 14th International Thyroid Congress held in Paris, France, that a fusion of Prize Lecture Awards came about, given regardless of nationality. The Prize Lecture has been named the NAGATAKI-FUJIFILM Prize. The 2015 Prize Lecturer joined a distinguished group of Prize Awardees from the Region. He was the 6th Awardee to speak on thyroid cancer and the 16th Japanese to deliver the AOTA Prize Lecture. The Awardee proposed calcitonin-doubling time and thyroglobulin-doubling time as potent prognostic factors for medullary and papillary thyroid carcinoma, respectively. These values provide important information for best managements of patients with these cancers. Furthermore he carefully studied the preservation and reconstruction of the recurrent laryngeal nerve in thyroid cancer surgery and is working for the implementation of intraoperative neural monitoring. Additionally he discovered a new pathological entity of thyroid cancer: Intrathyroidal epithelial thymoma (ITET) / CASTLE, and found the route of acute suppurative thyroiditis and named it pyriform sinus fistula.